The Asus Zenfone Max Pro M1 is surely the best smartphone that you can get under Rs. 15,000 (If you don’t care about camera quality as compared to the Redmi Note 5 Pro). The phone has a powerful Snapdragon 636 processor, a huge 5,000mAh battery, a stock Android experience, 18:9 display and dual cameras. At the launch event, the company promised that it would be rolling out an update soon to add Face Unlock feature. A new update is now rolling out for the phone, and yes, it does bring the Face Unlock feature along with the April Security Patch. This new update brings some improvements to the Fingerprint scanner as well, but it still doesn’t bring EIS which means we will have to wait for the next update to get that feature. Anyways, talking about the Face Unlock feature of the Asus Zenfone Max Pro M1, you will find it in the ‘Security & Location’ settings. When you tap on ‘Face Recognition’ option, it asks you to register your face. Just tap on ‘Continue’ and then add your PIN (if you have one set up on the phone). Once you have registered your face, you will see that the ‘Unlock Device’ option in the ‘Face Recognition’ settings is turned ON. 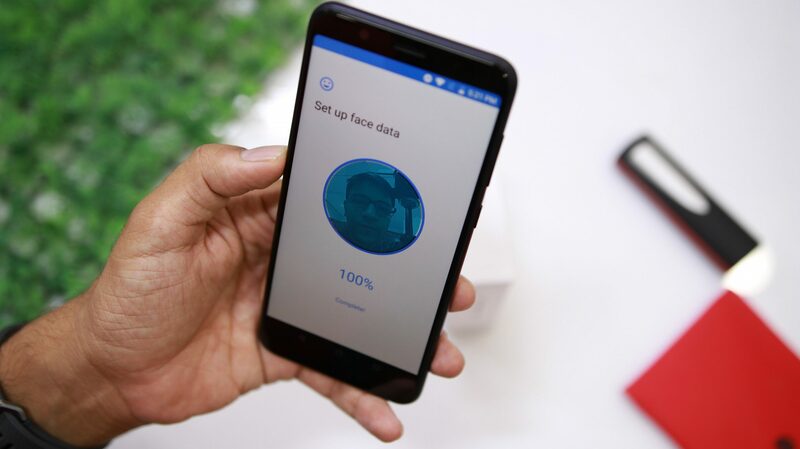 So, now you can unlock the phone with your face. Keep in mind that the Face Unlock feature is not able to detect the face in a situation where there is complete darkness.